The largest and most affordable Online Luggage Carriers Two Child Seats Shop! Luggage Carrier with Two Bicycle Seats shop the largest and most affordable! Do you want to buy a Luggage Carrier with Two Child Seats online? 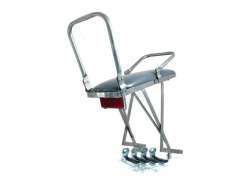 Hollandbikeshop.com has the Luggage Carriers with Two Child Seats you're looking for. You've got two children that you need to take with you on your bicycle? Then this luggage carrier for two children is the answer! The luggage carrier with two child seats is simply mounted on the back of the bicycle. At Hollandbikeshop.com you can find a wide choice of Luggage Carriers with Two Child Seats by brands like HBS. In our wide Bicycle Seats and Child Seats range on Hollandbikeshop.com you can find the most practical, safe and fun child seats and other transport options for the bicycle, like the Luggage Carrier with Two Child Seats. So you'll surely find the bicycle seats, child seats and luggage carriers with two child seats you're looking for! Hollandbikeshop.com is dealer of Luggage Carriers with Two Child Seats and has a large and affordable range. We also often have Luggage Carriers with Two Child Seats on sale or in our outlet, so keep an eye on our sale button. The largest and most affordable online Luggage Carriers with Two Child Seats bicycle shop!